Section 3.0 Introduction to NFB. • The use of negative feedback in amplifiers. Section 3.1 NFB and Gain. 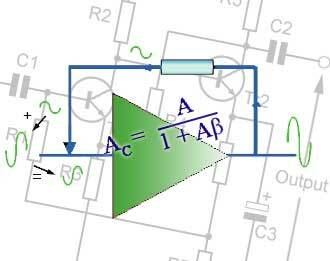 • Controlling amplifier gain using NFB. Section 3.2 NFB and Impedance. • Using NFB to control Input and Output Impedance. Section 3.3 NFB, and Noise. • Using NFB to Reduce Noise in amplifiers. Section 3.4 NFB, and Distortion. • Using NFB to Reduce Distortion in amplifiers. • Test your knowledge & understanding of negative feedback. Negative feedback is the technique of sampling some of the output of a device or system and applying it back to the input. This makes the input partly dependent on the output, and in doing so makes it possible to exert very fine control over whatever process is being carried out by the system. Negative feedback is almost as old as machines, and is used in just about every possible process where some control over the output is necessary. Cans of beans may be weighed as they come off a production line and if there is any difference between the weight measured and the ideal weight, the number of beans per can will be automatically adjusted further back in the process to maintain a constant weight. Manufacturers launching a new product will test public reaction to a small sample of their product by asking prospective buyers for their opinions, and adjust the product design as a result of the feedback. Anything from a builder repeatedly checking that the layers of bricks are level as he builds the wall, to an aircraft landing safely at the correct point on the airport runway is an example of feedback in action. There are two types of feedback commonly used in electronic circuits, positive (regenerative) feedback and negative (degenerative) feedback. Positive feedback is primarily used in electronic oscillators, it increases gain (and distortion if not properly controlled) and narrows bandwidth to such a degree that it can be the primary reason for oscillators to work at a single frequency, rather than a band of frequencies. This module describes the application of negative feedback in amplifiers, where its use provides a number of very useful attributes that improve the performance of the amplifier.